NIGERIANS were probably jolted by the Petroleum Minister, Ibe Kachikwu’s confirmation to a National Assembly Committee, last week (4/1/18), that the current landing cost of petrol is about N171/litre, i.e. well beyond the present N145/litre regulated pump price. Instructively, the deregulated price of petrol is about $1.00(N305)/litre in nearby Ghana. However, in the wake of deregulation of petrol prices under Obasanjo in 2004, and the anxiety of Labour and the Nigerian public on the adverse impact of rising fuel prices, this writer published two articles titled “The Mother and Father of Fuel Prices”(22.11.2004) and “Only a Stronger Naira Will Stop Rising Fuel Prices”(22.08.2005) in the Vanguard Newspaper. 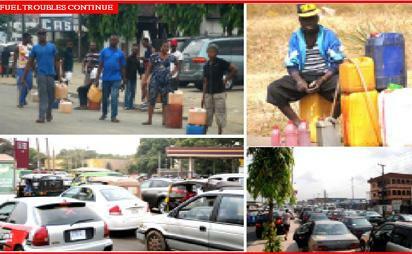 •Black market sellers and fuel scarcity anguish in Abuja, Kaduna, Warri and Port Harcourt, weekend. Photos: Olu Ajayi & Nwankpa Chijioke. The solution proposed in both articles, remain solidly valid today as it was over 12 years ago. A summary of both articles is again presented, in the hope that government will one day heed our counsel and resolve the dilemma of higher crude prices and weaker Naira exchange rates. Please read on. “The economic and social benefits of deregulation are evident from the demonstrated success in several countries. Deregulation would mean competitive market determined prices for fuel, and will equally drive improvement in customer services. Furthermore, our comatose refineries would be rejuvenated, while investors would also eagerly establish new refineries, with the assurance that their survival and profitability would not be dependent on market manipulations or distortions by Government. Petrol smuggling and hoarding would similarly cease to be an attractive venture while Governments’ Treasury will conversely be bolstered by the plug of the heavy leakages from subsidy. However, the oppressive inflationary impact of deregulation since commencement seems to be the exact opposite of popular expectations; for example, instead of lower prices, pump prices conversely remain on a continuous rise with a debilitating impact on the Nigerian patient! Consequently, NLC has become buoyed by vibrant public support to insist that the promised palliatives to deregulation and higher prices are insignificant and not likely to restore the Nigerian patient to good health. Consequently, we have both organized Labour and an enamoured President killing their beloved, slowly with love, despite the patient’s deteriorating health. The NLC and the Federal Government, obviously share similar aspirations, in their quest for improved social welfare, that would restrain inflation, and support a progressive economy, which is efficiently driven by competitive market forces. Furthermore, Nigerians also expect that with deregulation, new refineries will be built, to adequately supplement domestic supply, so that surplus output will become available for profitable export. Evidently, both NLC and government clearly desire the same basic objectives, of increasing job opportunities with diversification and expansion in industrial capacity; regrettably, the pursuit of these objectives seems to have taken different tracks and yet neither party is anywhere nearer the declared goals. Generally, the following factors have been canvassed as mainly responsible for rising fuel prices: these are the poor shape of refineries, additional cost of imported fuel, corruption and smuggling, increasing crude oil price and the price of the naira vis-à-vis the US dollar. However, a thorough examination of these major factors, will reveal that even if present refineries run at full capacity while new refineries are also built, the local price of petrol in such a deregulated scenario may only be cheaper than the cost of imported fuel by not more than 10-20%! The cost difference will be the additional cost of transporting crude oil to Europe or elsewhere and the cost of shipping back to Nigeria, plus local port and other clearing charges of the refined petrol. The potential cost savings from relatively cheap local labour may become nullified by the cost of provision of own infrastructure, particularly high cost of power, and the high interest rates on loans to importers. We cannot deny that corruption and smuggling indirectly affect petrol price, just as inefficiency in public service and lack of accountability could also lead to indiscrete resource allocations with attendant market distortions and higher prices. Although, massive crude oil smuggling, from exporting countries, may help to stabilize or lower international crude oil prices, but cross border smuggling of imported PMS instigates a bloated local demand and also represents a substantial open subsidy to the economies of our ECOWAS neighbours; however these factors by themselves, may not explain the geometric leap in domestic fuel prices from less than N1/litre in the 1980s to its present oppressive level of over N50/litre in 2005. Indeed, the popular welfarist argument that Nigerians should enjoy lower prices for their natural resource endowment may jeopardize the advantages of a free market mechanism and truncate foreign investments in local refineries, to sustain competitive product pricing and improved customer services. Besides, the cost impact of an open ended subsidy to stabilize petrol prices, in a climate of steadily depreciating naira, will have a catastrophic effect on the survival of existing public refineries, as they would most certainly go under if, for example, the NNPC continues to absorb daily subsidy values in excess of N350 million (over N150 billion annually) as reported by the Group Managing Director Funsho Kupolokun recently. This burden would ultimately sound a death knell on the prospect of private investment in local refineries! However, it is also realistic to expect that even if international crude oil prices are rising, the related increase in domestic fuel prices will be cushioned by a stronger value naira vis-à-vis the dollar (the crude oil value denominator), as the additional dollar revenue which automatically accrue from rising crude oil prices would also increase our foreign exchange reserves, to support a stronger naira exchange rate; in this process, domestic fuel prices will either stabilize or even fall with a stronger naira. Although, petrol will technically be cheaper, locally, when crude oil prices rise, smugglers of petrol will, however, be put out of business, as the stronger naira will reduce smugglers’ margins and make the business unprofitable! Thus the stronger the naira rate, the lower, ultimately will be the local price of fuel. Furthermore, it will also become expedient and not unduly oppressive to supplement government revenue with a 10-15% tax on petrol consumption, as in other more successful economies; the fuel tax so consolidated can be dedicated to critical areas of need such as education, health, transportation and provision of infrastructure. The post The mother and father of fuel prices – Henry Boyo appeared first on Vanguard News.